Fullness machine. High speed two thread chainstitch, top & bottom adjustable feed with Sensewmat 3 (III) electronic programmable fullness control for suit sleeve & armholes etc. Men's suits etc. Control panel instruction manual included. Previously used by high-end upholstery manufacturer. high speed chainstitch head with variable top feed & variable differential bottom feed. With top & bottom feed & front guide rubbing rollers. Twin needle flatbed chainstitch with 2:1 pleater assembly. Auto seamer. 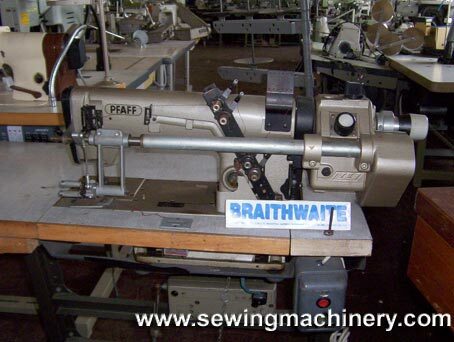 Special top & bottom feed chain-stitch machine with electronic control, photo cell, air operator guide system. Complete on unit with Quick needle position motor.